The CM-4 takes what made the CM-100 great and makes it into a smaller form factor. While the design and form factor remains the same, the components has been upgraded to Improve the quality and performance. Now you can have the best of both worlds, a compact speaker with good sound stage. 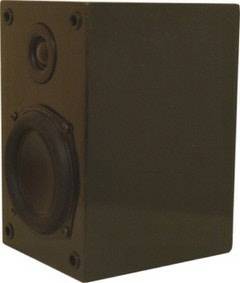 This speaker is great for those who are looking for a small speaker that integrate into any small room. a multi-channel system or even desktop or wall mounted systems. 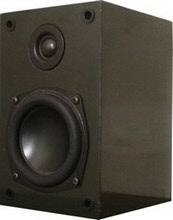 The CM-4 tiny speaker cabinet is crafted out of layered 1/2" thick MDF (medium density fiberboard) for increase ridginess and reduce resonates. Each cabinet is aligned with a new 3/4" silk dome tweeter for a wide dispersion combined with a fine tuned crossover for better driver blending The cabinet is sealed for accurate bass response. The result is smoother dialogue and bass response. 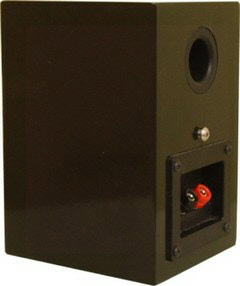 is accompanied by a 4" aluminum cone woofer driver with a rubber surround for good bass response. The new Linkwitz-Riley crossover provides a steeper slope for a better blending between the woofer and tweeter. The crossover features high quality aircore inductors and metallized polypropylene capacitors, all joint together by point to point soldering. All the features you would expect to find in larger and more expensive speaker. great sound and can easily integrate with a subwoofer. The CM-4i, i stands for “Tri-path” Amplifier (T-amp), This version of the CM-4 is specially designed to work with T-amps for better efficiency.